What a week. I don’t even know where to start. I guess with Sunday, when I worked a full day to make up for the days we were closed last week. Then came Monday, Tuesday and Wednesday, all of which felt like a day later than they actually were. I got home on average 7:30 each night, and got straight to work in the kitchen. I went to bed after 2 am every night. Now it’s Thursday, well after 2 and I am not nearly done in the kitchen. Did I mention that my company will be closed next week, so it’s about doubly busy this week? Yeah, I did drink loads of coffee. Why do you ask? Enough complaining about me. Let’s talk global issues. I honestly couldn’t believe how saddened I was at the death of Steve Jobs. Sure I discovered the news on my iPhone, which frankly I am in love with. But still, I never met the man, I never interacted with him, yet my stomach dropped when I heard the news, and I felt like I was going to cry. Why? I don’t know. Maybe because I am a gadget freak, and he changed the technology world forever. Maybe because I use one of his products on a daily (who am I kidding? Minutely) basis. Maybe it’s selfish and I simply worry that the company won’t go on to produce the same kind of quality products without his guidance. All I know right now is…iSad. Now lets talk yankees. They were blown out of the playoffs tonight. Y’know what? I changed my mind. Let’s talk about something more pleasant. Let’s talk Mini Shepherd’s Pies. I don’t know when and how this idea came to me, but frankly I am in awe of myself. I know, I know, I need to work on my humility, but that’s for another time. The great thing about these is how absolutely impressive they look. Nobody has to know how simple they are to make. Next time you have a party, or you have guests you want to impress, go ahead and serve this as an appetizer. It’s a true comfort-food-turned-elegant starter. Finely dice onions and sautee on medium flame in oil until translucent. Mince garlic and add to onions. Dice carrot finely and add to skillet. Add salt, pepper and thyme. Continue to cook vegetables until they are tender. Remove vegetables from pan. Add more oil. Increase the heat and brown meat, stirring frequently with a fork to break meat into small pieces. When meat is browned, turn the hear down and add back in the vegetables. Stir to combine. Add flour and stir well, cooking until completely mixed in. (You shouldn’t be able to see the flour at this point.) Add the tomato paste and stir until mixture is thick. Add broth and simmer until broth is mostly evaporated. At this point, the meat mixture is fully cooked, so taste it and adjust seasoning as needed. Fill pie crusts right to the top with meat mixture and set aside. Melt the margarine (either in a microwave or in a small pot). Pour melted margarine over potatoes and mash until potatoes are creamy. Add salt and pepper, seasoning to taste. At this point you can spoon the mashed potatoes over the meat, but if you want to go for the “wow” presentation with surprisingly little additional work, place the mashed potatoes in a pastry bag fitted with a wide tip (I used a 1M tip) and pipe rosettes over the meat. Place the pies on a baking sheet in the oven and bake at 375 for 25-30 minutes, or until the pie crust edges appear brown and the mashed potatoes are just turning light brown on the top. Linking this to This Chick Cooks. 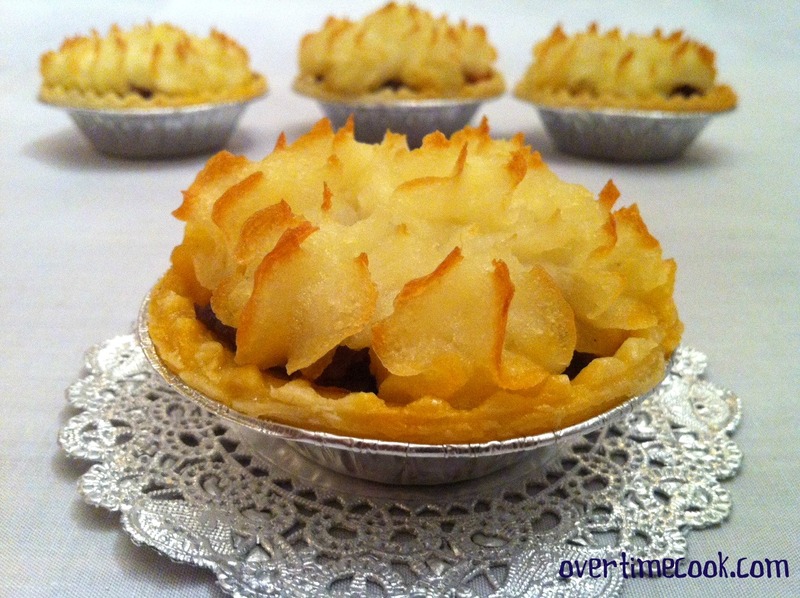 i’ve never thought of doing little shepherd pies like this – what a cute idea. i love the piped topping too – i usually just slater mine on with a fork! Thanks! I couldn’t believe how quick the piping was to do! What a cute and convenient way to serve this main dish! I love individual portions- They’re so much neater than a giant casserole that you need to scoop out, and they freeze well for defrosting just one or two at a time later. Hi Hannah! You sound like me- I am obsessed with minis. I never know how many people I am going to feed, so minis make it so easy! Girl, you are working way too hard. Hopefully you can squeeze in time to pamper yourself and get some rest. 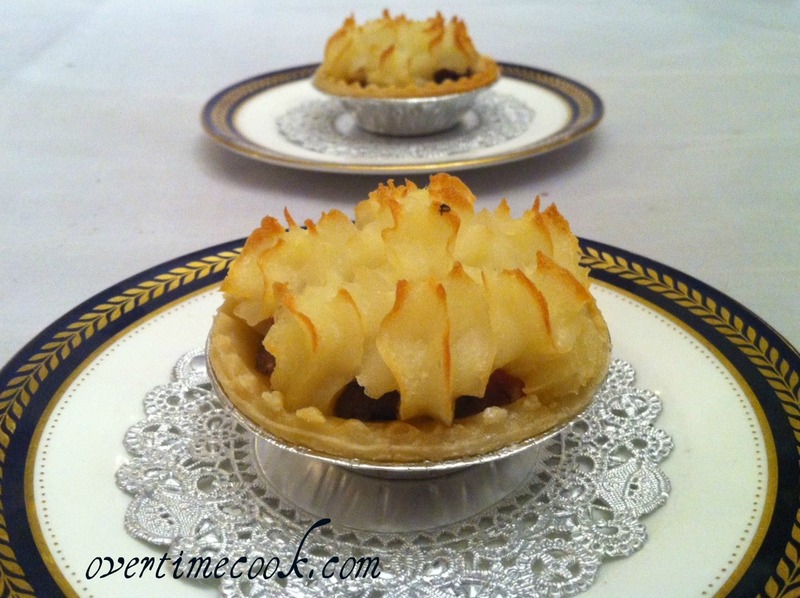 Great post however and your mini shepherds pie are as adorable as I’m sure they are delicious. I am working crazy hard, Paula, but hopefully once the holiday comes it will all be worth it! These taste even better than they look!! I definitely recommend them. Thanks!! I *love* these. How cute, and indeed, brilliant! You can work on modesty in a different way, these rock! That’s a pretty smart idea – looks great and good for portion control too. Thanks for sharing! I tried these and they are really as gorgeous as they look in the picture. Delicious, too! Let’s say I want to bake these in one pan, not mini individual ones. What size pan do you think I’d need? How would I adjust the cooking time if I wanted to make shepherds pie using the regular sized frozen pie crust? Can’t say for sure, as I haven’t tried it. Start with the amount of time on this recipe, then see how it looks! Do the mini shepherds pies freeze well? They do – but add the mashed potatoes and finish them at the last minute. Thanks! So if I’m making them for a yom tov meal can i do the potatoes a day in advance and just reheat the whole thing? I froze the whole thing, including the mashed potato, and they were fine. I made this once as an appetizer and it was delicious. I want to make it for Yom Tov as a main dish but 1 pie isn’t enough as a main.. Does it make sense to serve 2 pies per person? Or how else can I make it individual but for a main? 8 tablespoons to a stick of margarine. i am in the middle of making these right now for rosh hashana. I hope the piping comes out nice! Enjoy! I’d add the mashed potatoes just before serving for best results! How much broth is needed for this recipe? it is 1/4 _cup_ broth, correct? making these for the chag. super cute! All of your recipes are so amazing! I look forward to making this one, but I want to make it in a 9×13 pan- do you think the amount would fit well? Can you approximate how long I would let it cook? 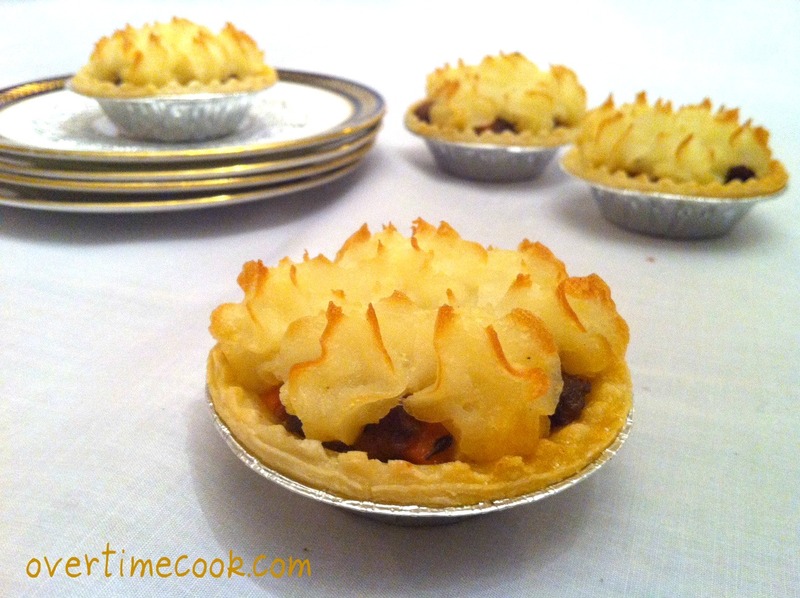 I can’t find mini frozen pie crusts anywhere – what do you think if I use mini filo dough instead? Any thoughts on baking time? Freeze before the mashed potatoes are added, then add them and bake fresh. Stop just before the step of adding the mashed potatoes. Wait do u cook then freeze with out potato’s or do u frezze the whole thing raw?